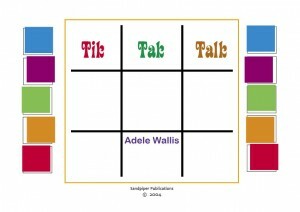 This language resource taps into the fact that everyone loves playing noughts and crosses. There are over thirty fun language games to play, and heaps more that you can make yourself, using the templates and ideas from these materials. The games provide an engaging and motivating format for children to learn and practice some simple language skills, particularly focusing on vocabulary building. The whole resource is easily adapted to suit your client’s needs and ability level. You can increase the complexity of the target sentence or the number of features requrired in the response. It is suitable for children aged 7 to 17 years, and is easily photocopied for home follow-up activities.